You probably noticed that I barely updated last week. Fortunately, the reason I haven’t had much time lately is because I’ve been making art! Big art, in fact! As some of you know, I’m attending Burning Man next week. Over the weekend, I was kidnapped* by my friend, Mr. Neil Nightshade, to help him put together his mobile photo studio. 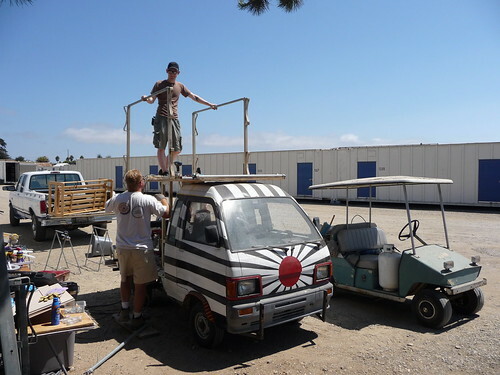 & so, we drove 4 hours south to Grover Beach and built an art car. I wielded various power tools, paintbrushes, and cheap beer towards victory! We stayed with Martin and Leanne, who were not only gracious hosts, but really inspiring creative people to be around. Martin did much of the construction and structutal work, and Leanne came up with an amazing idea for the project involving leftover movie theatre trailers that I can’t really properly show you until we get all the electronics attached. Neil did much of the wiring, soldering, and schematics for all the lighting on the car. I learned more about LEDS this weekend than I thought possible in a period of 48 hours! I’m hoping to participate in more large scale collaborative projects of this sort in the future. I love making websites and drawing, but nothing beats the ability to make something bigger than yourself, with the help of your friends. I’ll be posting pictures of how it comes out when it’s complete, and also photos of it at night with all the lights on. Thanks to Martin, Leanne, and especially Neil. * a note on kidnapping. I like it when my friends say things like “Want to go on a crazy adventure? Be ready in an hour.” I haven’t had nearly enough spontaneous interactions of this sort as of late, and I really, really love it. If you’re my friend, and you have a good idea for something epic and fun, please call me. Especially if it’s last minute.